This article is the second in a projected series of four, discussing the theology of the Good Friday ceremony of the Missal of St Pius V (part 1), the revised version of Pope Pius XII, and the Novus Ordo. For reference, complete descriptions of the first two are given in part 4.1 and part 4.2 of my series on the reformed Holy Week published in 2009. The portions of this article which discuss the rite of the Presanctified properly so-called are taken from part 4.2 of that series, but largely re-written. A fourth article will discuss the history of the fraction rite as part of the Good Friday ceremony. The purpose of this article is not to discuss the putative historical antecedents of the new Good Friday ceremony, with one exception. At no point in the ceremony are the major ministers dressed as they would be for Mass. For the readings, they wear only amice, alb and cincture, with the priest and deacon in black stoles. For the solemn prayers, the celebrant dons a cope, and the deacon and subdeacon dalmatic and tunicle; they remove these for the adoration of the Cross, the only part where they dress as they did in the previous form of the rite. For the Communion service at the end, they change to violet vestments, with the deacon and subdeacon in dalmatic and tunicle. The maniple is everywhere omitted; this is significant because the maniple is traditionally removed for ceremonies that are connected to, but not part of, a Mass, such as the Corpus Christi procession. The sense of deep mourning expressed by black vestments, including the folded chasubles proper to penitential seasons, is compromised not only by the use of the garments of joy, the dalmatic and tunicle, but also by the inconvenience of the ministers constantly changing their clothes. At the start of the ceremony, the altar is completely bare, without altar cloths, candlesticks or a Cross, whereas in the Mass of the Presanctified, it is set up as it would be for Mass, and the cloth is put on at the beginning. The regular bows at the words “Oremus” and the Holy Name are not explicitly suppressed, but if they are made, they are made to a void. At the Mass of the Lord’s Supper, the ritual of enclosing a large consecrated host in a chalice is omitted; a ciborium of hosts is consecrated instead, and brought to the Altar of Repose by the procession at the end. 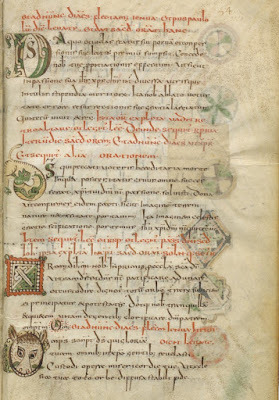 In the new rite, a prayer has been added before the first reading, a very ancient one attested in the Gelasian Sacramentary, and said in some medieval uses of the Mass of the Presanctified even into the 16th century. Here, however, it is said without any preamble (neither “Dominus vobiscum – Oremus” nor “Oremus. Flectamus genua. Levate.”), and with the short conclusion. The celebrant is directed to stand in plano before the altar, as the book is held in front of him by a server, (rather than at the Missal on the Epistle side), and to keep his hands closed. No prayer of the Mass is said this way. The reader sings the first reading from a lectern set in the middle of the sanctuary, not standing before the Epistle side with the book in his hands as at solemn Mass. The second prayer is said at the sedilia, not at the altar; it is introduced by “Oremus. Flectamus genua. Levate.” as previously, but “Levate” is sung by the deacon, not the subdeacon as in the ordinary rite of Mass. The subdeacon sings the second reading also at the pulpit in the middle. The Passion cantors do not say “Munda cor meum” before the Gospel, but they are blessed by the celebrant; this is the exact opposite of what is traditionally done at a Requiem, in which the deacon says “Munda cor meum” but is not blessed. For the solemn prayers, a cloth is put on the altar; the Missal is placed in the middle, rather than at the Epistle side. 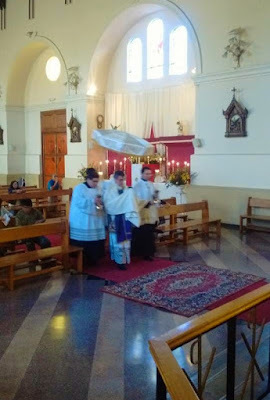 The priest, deacon and subdeacon come before the altar, and ascend to the predella; the rubrics do not say that they genuflect before doing so. The celebrant kisses the altar. The deacon and subdeacon stand to either side of him (“ministris sacris hinc inde astantibus”), not in line behind him as at Mass; the word “Levate” is sung by the deacon, not the subdeacon. After the Solemn Prayers, the major ministers return to their seats, and remove the cope, dalmatic and tunicle. The priest and subdeacon remain standing at the sedilia, while the deacon, together with four acolytes, goes to the sacristy. He returns carrying the veiled Cross, preceded by two acolytes, and accompanied by two others carrying lighted candles. When he arrives before the altar, the priest and subdeacon meet him in the middle, where the priest receives the Cross from him. The rite of uncovering the Cross is not changed, except that the two acolytes holding the candles remain at the sides of the priest. As soon as the Cross is completely uncovered, the priest hands it to the two other acolytes, who hold it upright by the two arms, standing on the predella and facing the people. The two acolytes with the candles kneel on the predella, on the sides, where they put their candles down. As in the earlier rite, all come in procession to the adoration of the Cross, first the priest, then the deacon and subdeacon, the acolytes and the attending clergy. The ritual is very much simplified, no longer consisting of three double genuflections, i.e. kneeling and making a profound bow, but rather three simple genuflections. (“simplici genuflectione ter repetita”.) After the third genuflection, each person kisses the feet of the Crucifix and returns to his place; the rubrics do not mention another genuflection after kissing it, as in the previous rite. When all in the sanctuary have adored the Cross, it is brought out of the sanctuary for the adoration of the faithful. The acolytes hold it up straight, accompanied by the two other acolytes who hold the candles. As described in the previous article of this series, the “Communion” which is received at the Mass of the Presanctified is in the act of slowly approaching and kissing the Cross. It is of signal importance that the Lord comes to the faithful on the Cross just as he does in sacramental Communion: from the altar, and back to the altar. In the new ceremony, the importance of this gesture is notably reduced by the absence of the Cross from the first half of the ceremony, and the radical simplification of the adoration. I do not think it too much to see in this an example of the obsession with efficiency typical of the modern (i.e. post-war) era that gave birth to this rite. The acolytes then bring the Cross back into the sanctuary, and set it in its place upon the altar, while the two acolytes who held the candles set them on the altar. The ministers change from black to violet, as mentioned above; the deacon brings the burse to the altar, and extends the corporal, while an acolyte places the Missal on the Gospel side, with a purification vessel and purificator. The solemn procession by which the Sacrament is brought to the altar at the Mass of the Presanctified, which is the procession of Maundy Thursday in reverse, is no longer done. The deacon and acolytes go to the Altar of Repose to bring the Blessed Sacrament back to the main altar. The Sacrament is carried by the deacon under a humeral veil, with two acolytes carrying candles on either side of him. 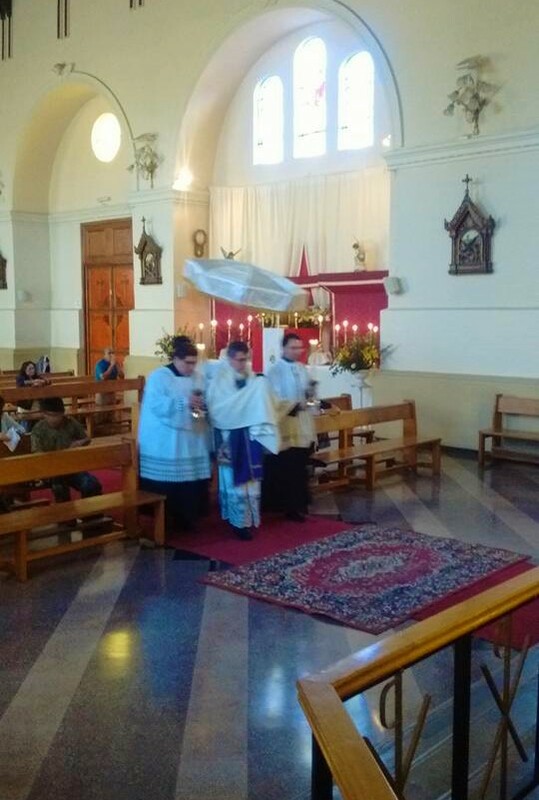 The priest and subdeacon do not participate; incense is not used. At the main altar, the deacon places the vessel with the Sacrament on the corporal, removes the humeral veil, genuflects, and withdraws to the Epistle side. The acolytes place their candles on the altar, which now has four candles on it, where there would be six for a solemn Mass. All the subsequent actions in imitation of the Mass – the preparation of the consecrated Host upon the corporal, the preparation of the chalice, the incensation, the washing of the hands, and the prayers from the Offertory – are no longer performed, again, divorcing the rite from that of the Mass. The introduction “Oremus. Praeceptis salutaribus...” is recited, not sung. The Lord’s Prayer is also recited, not sung, by everyone in the church, not just the priest as at Mass. (A new rubric specifies that it is to be said in Latin.) The rubrics also prescribe that the priest keep his hands closed for the Lord’s prayer, whereas they are open at the Mass. The “Libera nos” is recited, not sung, by the priest, but with hands open. He then says in silence the prayer “Perceptio Corporis tui”, and communicates with the normal rites of Mass. Holy Communion is then distributed to all who wish to receive, with the normal ceremonies. After Communion, the priest purifies his fingers in the vessel set on the altar for this purpose; there being no chalice present, he does not perform an ablution as at Mass. The Blessed Sacrament is returned to the tabernacle of the main altar; the Missal is then placed in the middle of the altar in front of it. 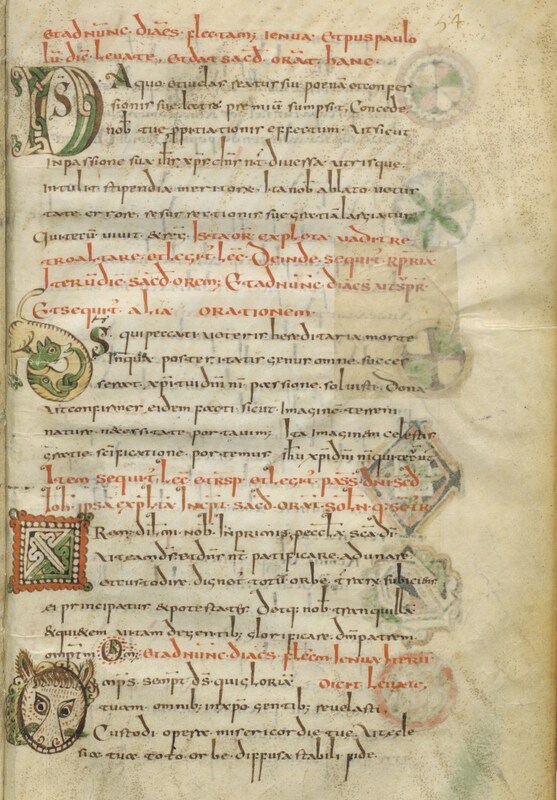 The priest sings three new prayers, each one preceded by only “Oremus”, (without “Dominus vobiscum”, or “Flectamus genua - Levate.”), ending with the minor conclusion (“per eundem Christum Dominum nostrum”), keeping his hands closed. The deacon and subdeacon stand on either side of him, rather than in line behind him. The major ministers descend from the altar, genuflect, and return to sacristy. Afterwards, the Blessed Sacrament is brought to the sacristy or another tabernacle.